Our inspiring super-gran, Georgie, has done it again! 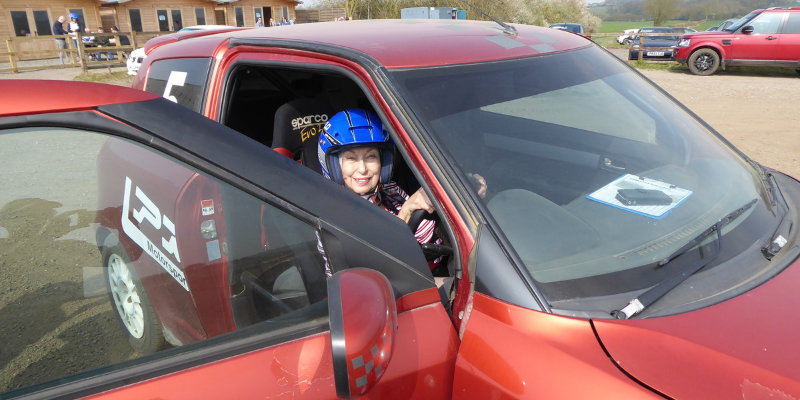 An 83-year-old grandmother of four from Bishop’s Stortford has raised approximately £1,400 for St Clare Hospice after jumping into the driver’s seat at a Suzuki Swift Sport Cup Rally Car Race. Goolmohr ‘Georgie’ Cantel is an avid St Clare supporter and ‘local legend,’ taking on an annual adrenaline-based challenge in aid of the charity for the past four years. Georgie’s latest hair-raising fundraising feat included taking to the racetrack at Langely Park Rally School in Saffron Walden on the morning of Saturday 30th March. Driving six laps, each three miles long, Georgie put ‘pedal to the metal’ in a Suzuki Swift Sport Cup rally car to raise vital funds for the Hospice. During her five years volunteering at the Hospice, Georgie has raised almost £15,500 for us through a series of sponsored adrenaline-fuelled challenges – as well as several charity Race Night and Afternoon Tea Party events. From a 490m zip wire flight (50m above the ground!) to scaling the O2 in London and whizzing down Stratford’s Orbit slide, Georgie’s fundraising fun has this year been topped by her latest charity challenge in aid of St Clare. “After the race, I was offered to do a ‘fast, hot lap’ with Tom, their Rally Car Racing Championship winner. ‘YES!’ I said! I held on tight as the car rattled, dust clouds blowing around and gravel flying about. Was my heart racing and blood pumping? Yes; it was awesome,” Georgie adds. Georgie is a dedicated volunteer on our Inpatient Unit, tending to patients and their relatives by offering a humble cup of tea or biscuit throughout the day, as well as a listening ear and a chat. Georgie’s role also includes keeping the Unit tidy of used plates and cups, in addition to serving meals to patients in their rooms throughout the day. “My role at St Clare means that I see first-hand the difference their care makes to those who are staying on the Inpatient Unit,” says Georgie.